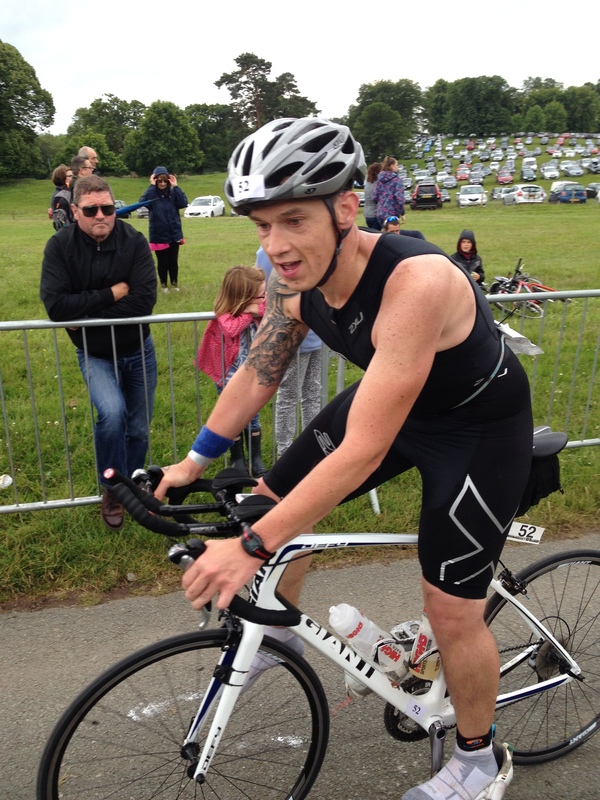 So I rounded off June with my 4th event of the month by completing the Gauntlet 70.3 at Cholmondeley castle as part of the castle triathlon series. I had the usual bike mishaps leading up to the event and ended up changing my rear inner tube 3 times on Saturday night till I located one which didn’t go down ( with thanks to a tesco cheapie ) So I was eager on Sunday morning to check the tyre situation, once relived to find it still inflated I forced down the usual porridge and headed to drive the 30 mins to registration. Typically early, as normal, however so early that registration hadn’t even opened this time is some sort of a record. Myself and the good wife spent a good 10 minutes looking for the water – assuming it was right next to the castle as that’s what they did in the olden days wasn’t it – but no it was right behind us and marked with the usual fluorescent buoys. First silly mistake of the day! Registration went smoothly as ever and then I took my turn in the queue for the marshalls letting you into transition – it took ages due to one marshall altering everyone’s helmet straps – literally everyones he had a fiddle with. The racking wasn’t numbered, it was sort of a dump your gear in the next available slot – the general noise of such a process was only dampened when Lucy Gossage walked past and myself and my fellow age groupers fell to a hushed silence – like being in the presence of greatness. 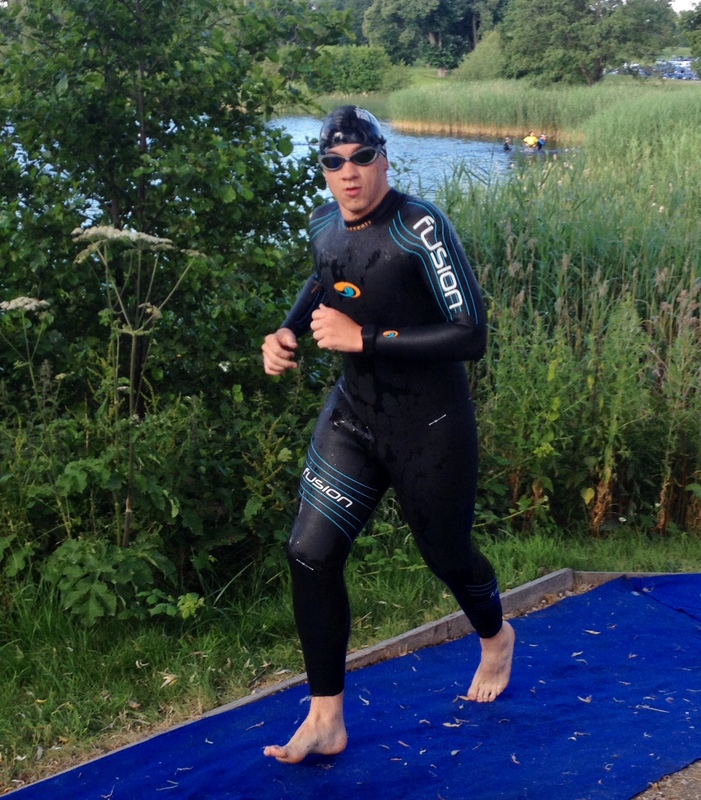 I completed my usual bumbling about and ensured I used plenty of Udderly smooth before I finally got my tri suit on. Down to the water’s edge for the briefing and trying to understand the most complicated swim layout I have done I think. It was a two lapped course with a strange layout which also required you to get out run along the bank and over a pontoon, up a bank and then back down to the edge over another pontoon then get back in. As ever my plan was just to attempt to follow the person in front. 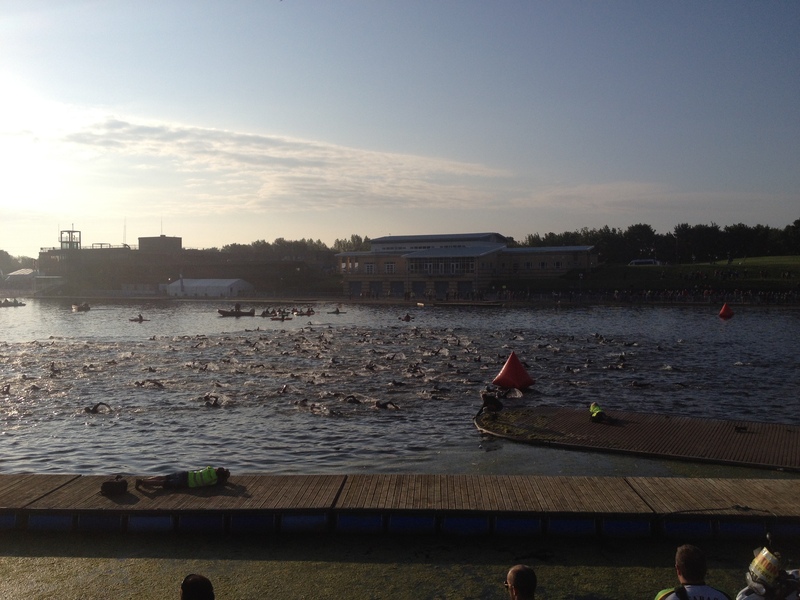 I had the usual swim and pre-race warm up (pee) and made my way to the start line. As the pro’s got ordered back I somehow managed to be right behind Joe Skipper and right next to Lucy Gossage – clearly I seem to have delusions of grandeur when it comes to my swimming ability. Then the next silly mistake – I couldn’t find my bike – the racking had the little stickers form a previous event and I didn’t remember that it was a dump anywhere type scenario so I spent what seemed like an age trying to find my stuff. The good news out of this was that there appeared to be still a fair few bikes around mine, so I must have done ok. I then remembered what it all looked like and started stripping off as normal. 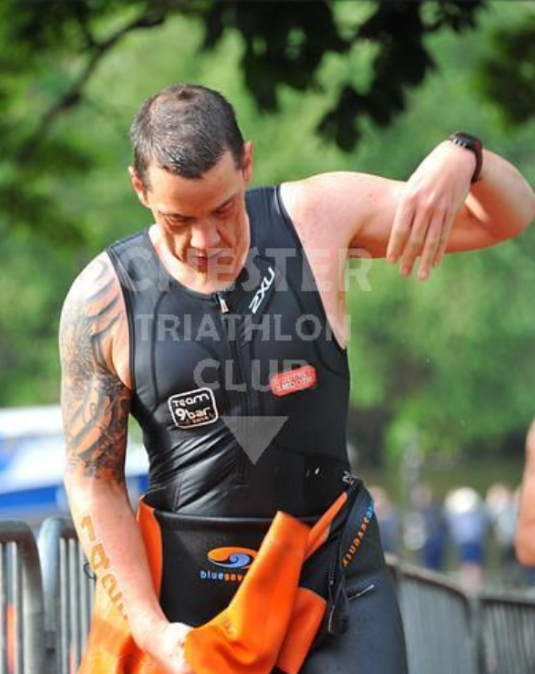 Struggled to get the 9bars into the back of my tri suit and set off in a slow for me first change. Out onto the bike course and my bike computer wasn’t working – I couldn’t decide what to do – stop and attempt to fix or keep going. Due to knowing I had lost time in T1 I kept going and worked off my HR monitor for the first 10k, before I reconciled with myself that I was being stupid and should stop. The transmitter had slipped down the spoke so it was an easy fix and only cost me a small amount of time to fix – with Heinz sight I should have stopped straight away and sorted. I got going again and then felt a popping noise from behind me and the feeling of something being released form my back pockets – namely one of my 9bar’s. The race belt must have been caught underneath it and as it rode up as I cycled along it must have pushed the bar up and out. 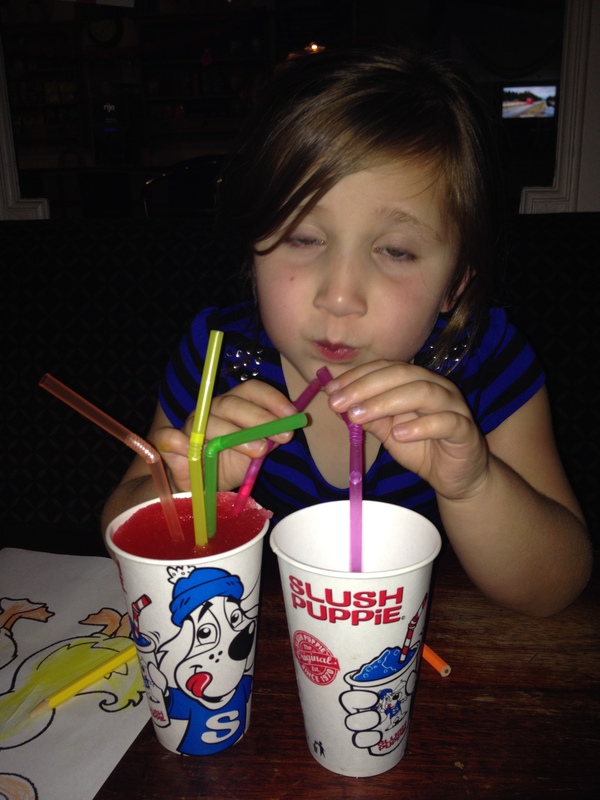 Another blooming mistake. On the second lap when I was eating my remaining bar I hit a pothole so hard that I managed to drop half of it. At that point it was more a case of feeling that this was going to be one of those races, especially as my lower back seemed to be tightening and getting down on the bars became a struggle. 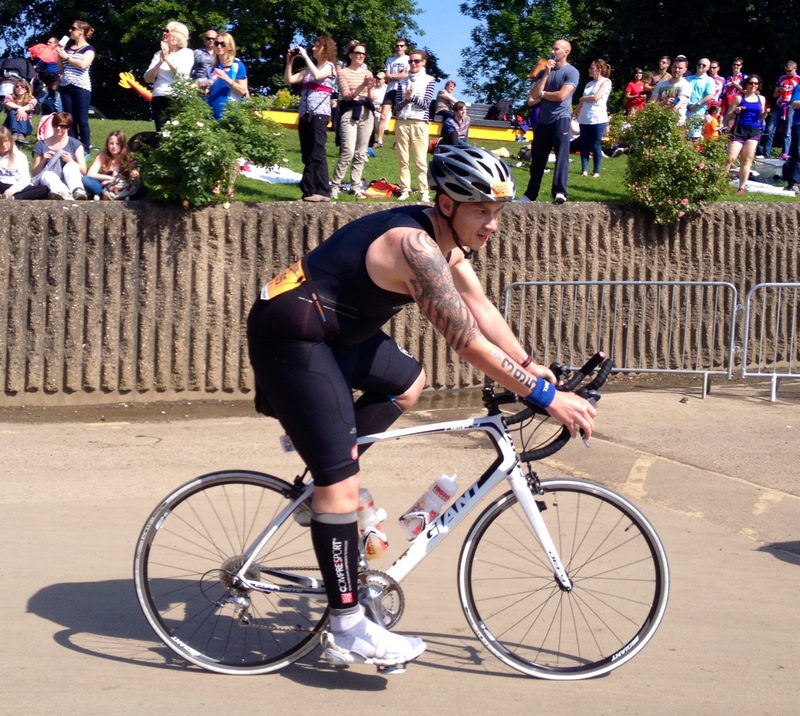 However on the first lap two guys came past me, the second none and the third two more – one of which I had a nice chat with as we climbed harthill for the last time and one who had an awesome IM tattoo on his calf. The route was hillier than I was expecting and I wasn’t sure to be happy or disappointed to be back at about what I thought was 3hrs ish. This time there weren’t many bikes in transition – again another surprisingly good sign. By this time Zoe and my parents had joined sue and I managed to sneak a kiss from my daughter before I headed out on the first of three laps of the run. I figured that 10 seconds wouldn’t matter to me and it did my mood a world of good. I didn’t really know what to expect on the run route, I knew it was mixed terrain with limited feed stations so my vague plan was to run between them but make sure I got enough fuel on board when the opportunity arose. I felt pretty good setting off, no cramps and the back eased as I went. The route I think can be described as undulating and I was happy to see the first feed station at 2k – I promptly stole a gel, some jelly babies and a drink and set about keeping my HR in the right place and attempted to focus on the road in front and no further. The tactic seemed to work as I was passing a fair few of the athletes from the smaller distance events and not that many seemed to overtake me form the gauntlet. Two who noticeably lapped me were Lucy and Joe – both seemingly running on air, effortlessly floating along and past me, it’s one of the most remarkable sights to watch a pro reel you in and then blast past you. The worst part of the run was the last, an off road climb through a forest which I walked a section of on each lap – I kept the gel till this point and reassured myself that this was time well spent, a march and a gel would see me right. Then it was up and over a bank next to the castle and down to the finish – well two more laps first. Again hearing my family shout encouragement was a great pick me up and a high 5 from Zoe meant the world to me. I felt ok all things considering and was still surprised that not more people had overtaken me – maybe the salt capsules do work after all and by concentrating on the immediate road in front of me I was doing ok, the second lap passed without much issue and I resisted the urge to head down the finishing chute and went out for the last 7k loop. Same principle on the last lap – head down, focus on breathing, keep moving and keep counting down the k’s, look forward to the end, to the pint, to the ice cream – to the sit down at least. As I topped the bank I could see my daughter already due to her orange outlaw top and the race director was almost holding her back so she didn’t head down the chute before me. Well she went off like a little pocket rocket and I struggled to keep up with her as we finished together. To be honest I don’t think I could have been prouder of her or myself. I looked down at the time and my watch said 5:30 something when I turned it off, my brain couldn’t compute what my run split must have been. The organisers thought Zoe has so cute they actually gave her a medal to match mine to keep and such things are what makes great events in my eyes, keeping family and friends happy with free music and attractions is also a great idea. I did my usual post-race lay down / sleep / drank about a litre of coke and then went to find my times – I couldn’t believe it. 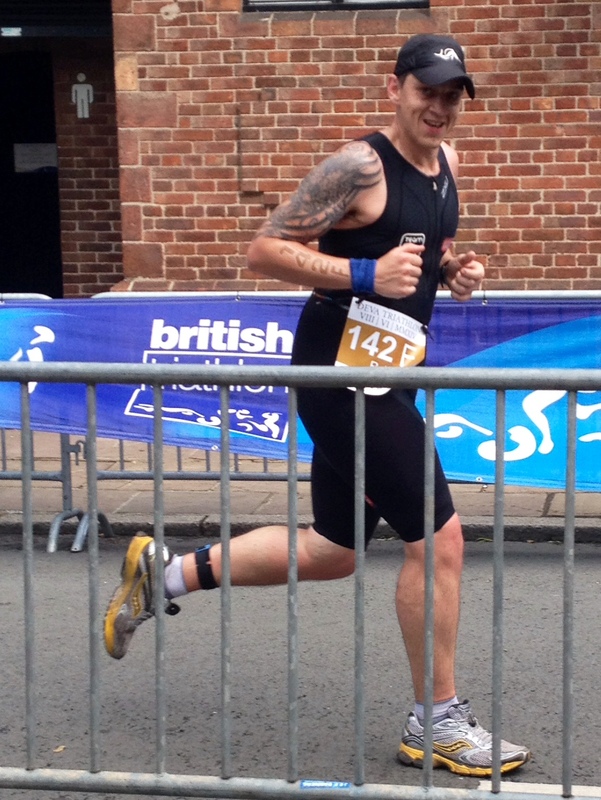 A 1:47 HM time is unheard of for me – in fact my stand alone HM is 1:44 so I was over the moon and it helped to ease the pain / stiffness which was developing nicely. 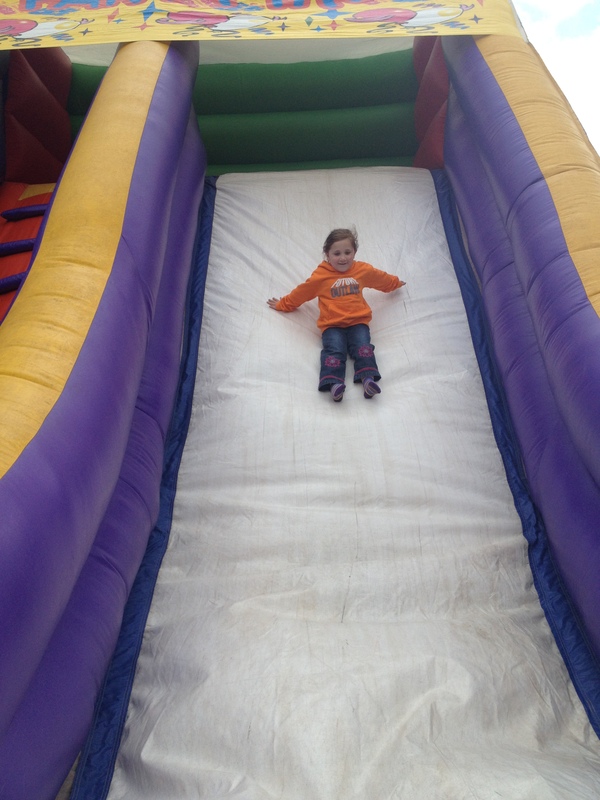 I picked up my rucksack full of freebies and headed for the free food, which my wife said was nice, and sat watching Zoe on the bouncy castle. To top a fantastic day out we called at the local ice cream farm on the way home and I rocked calf guards, shorts and flip flops round a packed family attraction, still smelling of sweat and with salt crusted to my face. Needless to say I got some funny looks. 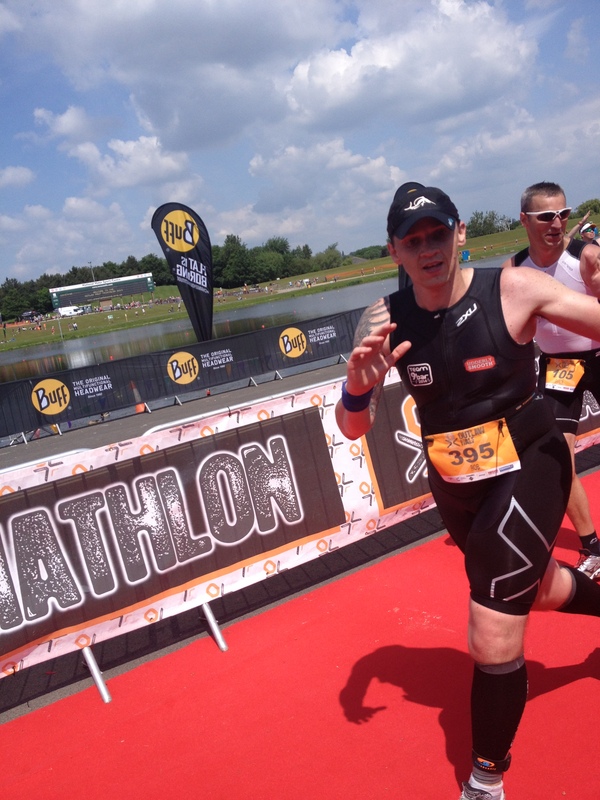 Overall I was delighted with the day – nothing broke, my family had a great day out, I learnt plenty of important things from my mistakes and I finished well with less pain than previous 70.3’s. I have done 3 now still last August; ultimate half in 5:26 on a flat course, outlaw half in 5:28 on a flat course but boiling hot and now the Gauntlet on a hilly course in 5:29 and can still walk afterwards. This morning I found out I came 24th overall in the event which considering that includes pro’s and relay teams and I made up about. Little update on the calamity of the weekend I have just suffered. Trained well last week, other than missing swimming due to having to work late I got some good miles in and felt good ahead of the pre-planned adventures for the weekend. Mainly a long ride into triple digits and then a long run into HM territory. On Wednesday night I did 40 miles riding tough in the heat and choose a hilly ish route to undertake and was happy with the average speed of over 21mph, Thursday night I watched the shambles of an England side lose to Uruguay whilst on the turbo and gently did 24 miles whilst rediscovering my ‘love’ for said turbo. Friday morning, up early and did a steady paced 10 mile run in the morning heat and felt tired but pretty awesome afterwards. Friday night did all the jobs to free up the weekend and prepped the bike ready for the ride in the morning. By my standards they would be big mileages, I hadn’t ridden over 62 miles this year and only twice run 13 miles. Saturday morning came and off I went with no fixed route but the knowledge that I would aim for a looped 40 miles to get another bottle from home of fluid. I set off at a comfortable pace, but noticed it seemed tougher than it should have for the speed I was going, even freewheeling down a hill the bike didn’t have the same desire to go quick it normally has. Cue stopping and me checking the bike over, then cue much swearing. 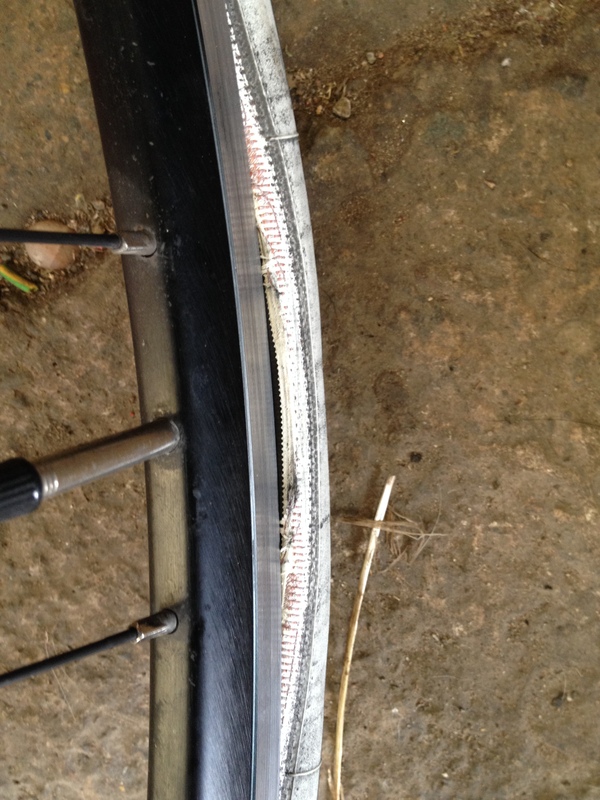 Another spoke had come off and as a result the entire back wheel had developed a nasty untrue wobble when I span it. So 15 miles into my fun I cycled 3 miles home very steadily and then sat looking at my bike in disgust. Literally every time I have attempted to go long this year either my body (with the help of a loft) or my recently my bike (spokes x2 now, rear derailleur snapping, service) have ruined the intended plans. I promptly sulked and waited for the house to wake up so I could share my latest round of misfortune. When the local bike shop opened I phoned and then headed straight there – feeling annoyed and slightly tired. Dropped the bike off with the hope it would be fixed by close of play but more likely Monday. Went home did some gardening and was generally grumpy – got a call from the shop saying it was fixed and ready to collect, so off I went before putting the phone down. Got home and went straight out on it in the hope that I could at least get some good miles in late in the day – maybe the plans wouldn’t be disrupted to much after all. Completely forgetting the original plan of returning for another bottle after a couple of hours or so. So I find myself on a country lane, with a puncture, in the baking afternoon sun, with cows looking at me over a fence without any fluid or any real desire to move. I fixed said puncture and cruised home thinking I could nip back out for another hour or so with some more fluid – but as I got closer and closer the desire just seemed to drain out of me, to be frank I couldn’t be arsed. Now I had a willing bike but an unwilling body. As I am trying to be sensible and not get injured again I consoled myself that I had still done 70 miles in the day in tough conditions / circumstances of my own making at a reasonable speed of just under 19 mph and I still had the run on the Sunday morning to look forward to. Early to bed and early to rise to run long and salvage the weekend. Got dressed in the spare room as per normal and started doing the stretches as per normal – most of which involve my lying down on my back. Woke up 20 minutes later with zero energy or desire to move. Made it downstairs and had a coffee but that didn’t help either and decided to sack it off and go later in the day. Being conscious of the fact that I have manipulated family weekend life every weekend of June I thought it wise to spend a bit of time with them and have some fun – so we went swimming (not swimming swimming, more splashing and throwing balls around swimming) and then had a bbq with some friends. I had a few beers and it put things into perspective about the family / ironman training time split which undoubtedly has not been correctly aligned recently. By my 5th beer I didn’t care about the lack of a long run over the weekend, in fact I didn’t care about anything very much apart from starring in the game of football on the lawn and having a goodtime. So cue this morning and again lying on the same carpet doing the same stretches – figuring I would run long this morning instead and just swap my Monday rest day for the previous Sunday. Job sorted – everyone’s a winner. That’s when all hell broke loose, a volcanic eruption of my insides wanting to be outside and quickly and in great quantity. I will not go into minute detail but let’s just say I managed to read pretty much all of the latest 220 magazine this morning. I sit this writing whilst at work and so far today I have managed water, a cup of coffee and half a banana. I have to say I feel utterly pants, with rumbling guts held together by drugs – devoid of energy, devoid of appetite and devoid any motivation other than to sleep. I even started looking at deferring the ironman place because all of a sudden everything seems unattainable – sure it will pass but the option of transferring seems like a good idea as it would also give me a target for next year to work towards. 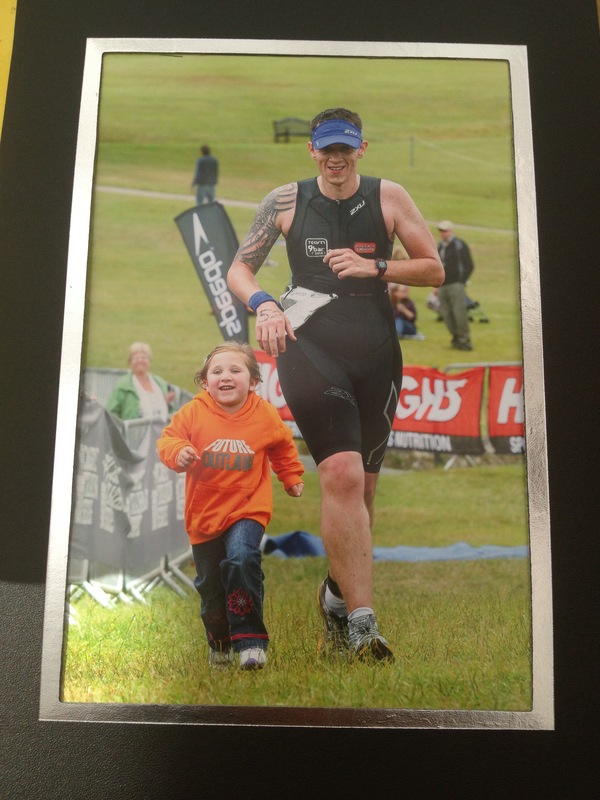 On Sunday I completed the Keswick Long Distance triathlon in the lakes, an event sponsored by 9bar and which allowed me and the family a wonderful long weekend away. So we packed up, crammed in Eric and headed up north on Friday afternoon and found the holiday park we would be staying in. You know the type of place – would have been lovely 20 years ago when new, but now required a bit of Elvis – some tender loving care. Not that Zoe cared – as long as there is dancing of an evening and swimming of a day with the occasional fish finger thrown in, all is well in her world. We all typically enjoyed the sights and tastes (burger and chips, ice cream and cider) of such a location on the Friday and Saturday and with the England game on late on I made the somewhat foolhardy decision to stay up and watch it. Foolhardy because I believed that England stood a chance and foolhardy as it allowed me only 4hrs kip and to be semi filled with cider come the start line on Sunday morning. Amazingly as per normal I managed to wake myself up before the 5:30 alarm and then failed in my mission to not wake everyone else up before departing in the vague direction of Keswick. As is my want I like to get there early and set up shop and then relax in the knowledge that everything is where it should be. This time I had added reason to be early to the event as I wanted to properly meet some of the wonderful people from 9bar who would be there. They found me rather than the other way around and had a nice chat with fellow twitter’er Andy Grasby who accosted me in transition. Wandered down to the edge of the lake and watched the sprint distances start before some photos from Alan and then into the murky waters for a warm up (pee). Thankfully when the hooter went off for the start the water cleared and the swim, after the now usual boot to the face, was calm and I managed to find some decent space to swim in – no real issues or stresses and I was attempting to be more relaxed than usual. I had been warned that the 1000m swim was long and so I wasn’t entirely sure what time I would be out of the water in, but could see a few in front at the turn around point and a fair few behind so I was pretty happy at that point. 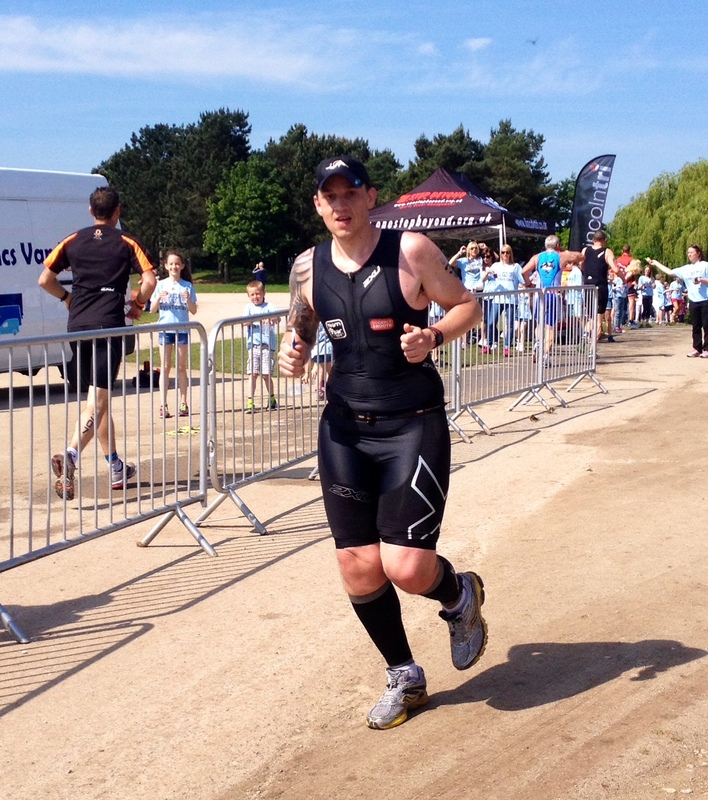 Turns out I was out of the water in a somewhat remarkable 23rd place. 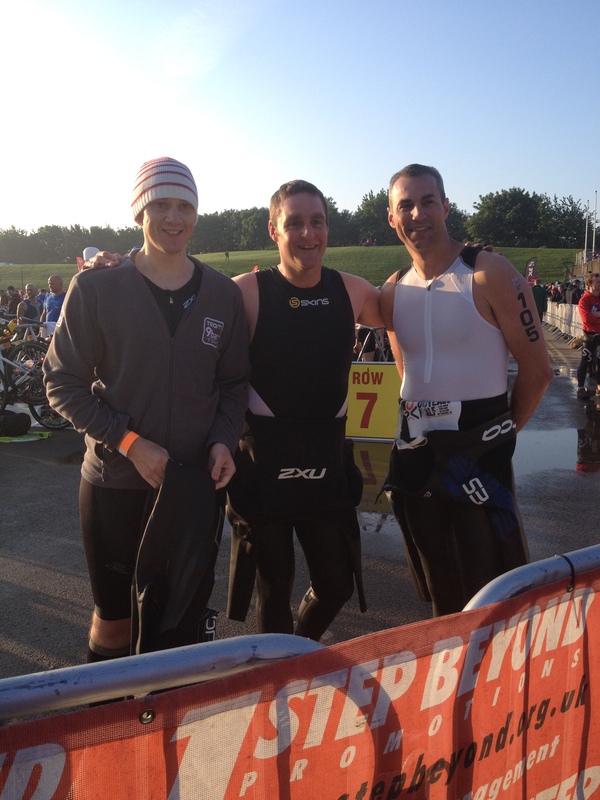 Out of the water and started the run to T1 up some stairs / tarmac / grassy hill. Find the bike and was out in double quick time – I really do excel at T1 and T2, probably something to do with the lack of movement involved. As we were in the lakes I was expecting the bike and run to be hilly and they didn’t disappoint – one of the main climbs was pretty much straight away and being honest a number of people came past me as I huffed and puffed up it. 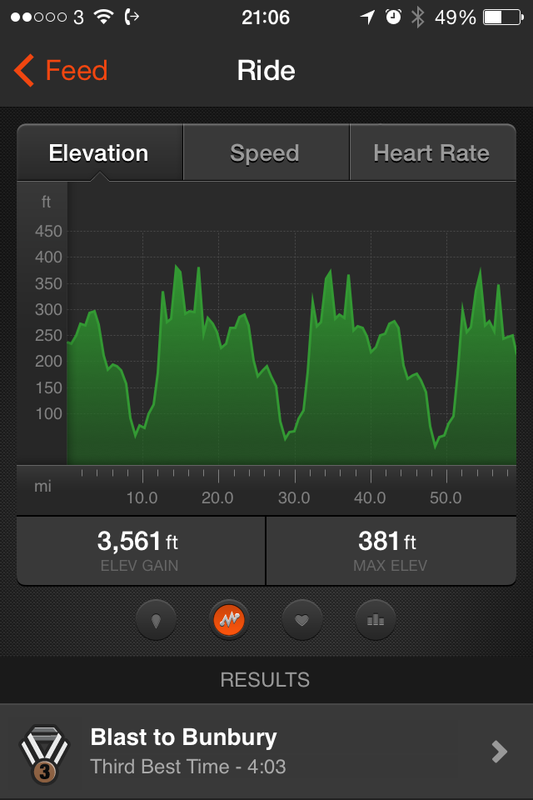 Definitely need to add in some more regular hills to training pre wales. One thing I wasn’t prepared for was the narrow roads coming down the descents and being conscious of bigger outlaw sized fish to fry I took it easy and took no risks like others around me on the tight corners, overtaking vehicles (which cost me a good minute being stationary behind a caravan as it battled a bus) and stupidity at roundabouts – where two blokes almost got nailed by a camper van, which would have 100% been the cyclists fault. The run followed a similar vein – in fact it was pretty much one long climb up and over a hill. I felt good on the flat section that preceded it and actually caught a couple of people in front of me. I had acquired and taken some salt tablets prior to the event and with keeping my HR at a steady rate I felt good, in a nice rhythm with no cramping. Then the hill started and it never seemed to end – the only run I have ever done which was similar was up the quarry at slateman, again the views were great at the top but I am definitely not a mountain goat. Coming down was just as tricky and I made steady progress back to the tarmac, again mindful of my ability to injure myself. 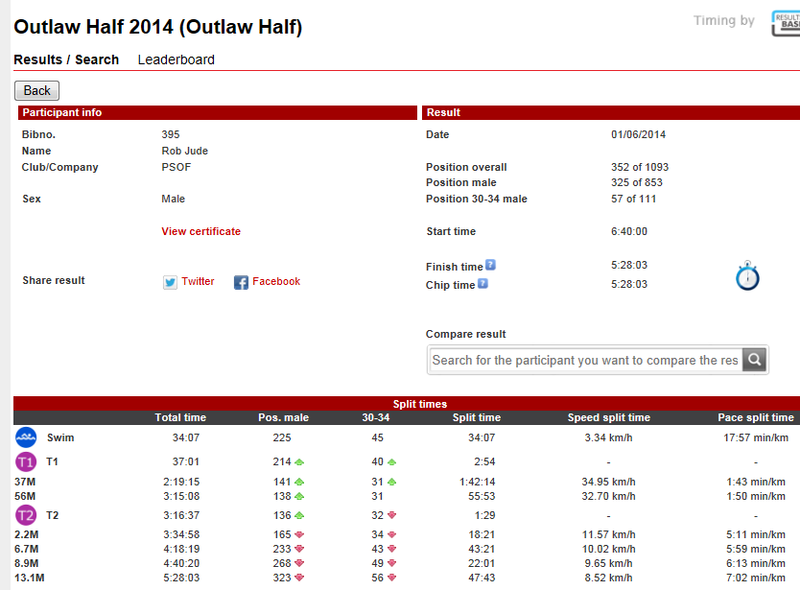 Back into the home straight with a bumper crowd to finish just over 2:30 – to come 64th out of 350 odd starters. Could I have gone quicker? Maybe – would I have injured myself? Probably knowing me. 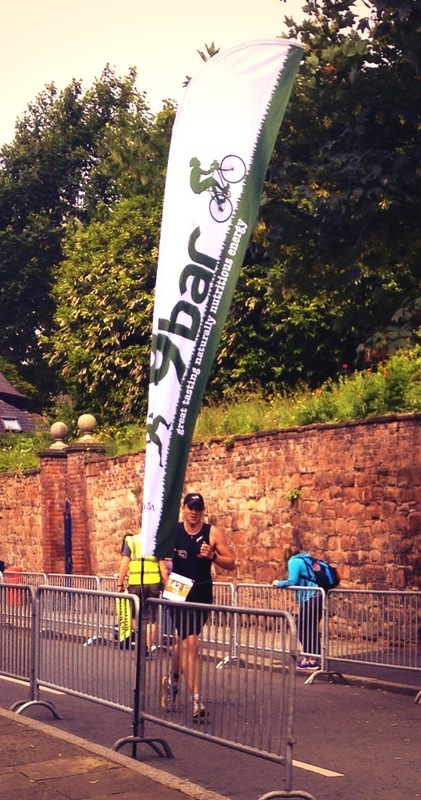 I spent an enjoyable couple of hours talking to the 9bar crew in the sunshine at the event and watching fellow competitors come in, including the half and full marathon finishers and concluded that I was lucky. I was surrounded by likeminded people who care for the events / products they make, advertise and sell and have supported me greatly this year. 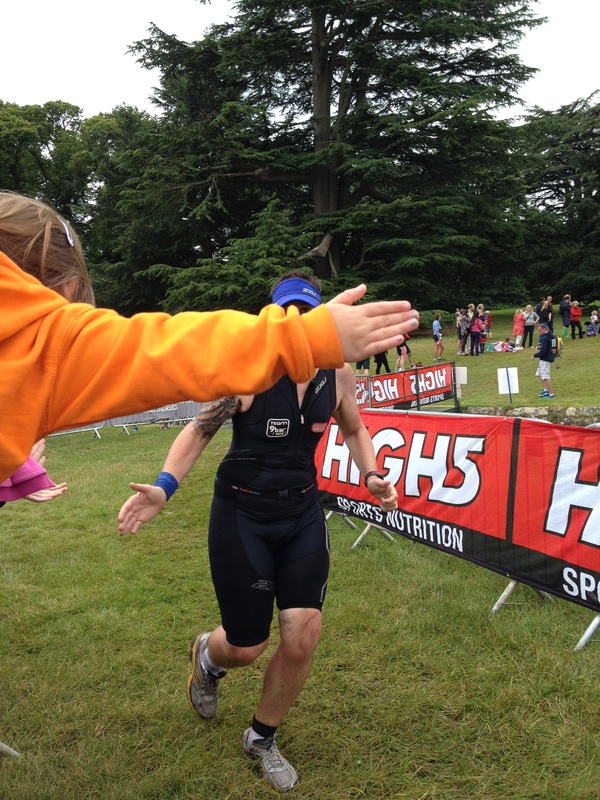 Also as I was handing out 9bars to finishers and watching the RAF helicopter fly over (http://www.independent.co.uk/news/uk/home-news/man-dies-at-great-north-swim-on-windemere-in-the-lake-district-9536686.html) I gave thanks silently to my wife and daughter who have been so supportive to me. It’s strange how emotional it can make you feel, watching the smiles, the pain and the delight of people finishing events and it always makes me feel grateful. Discovering that someone had broken an ankle on the run and that someone had died in a nearby lake kind undermined. 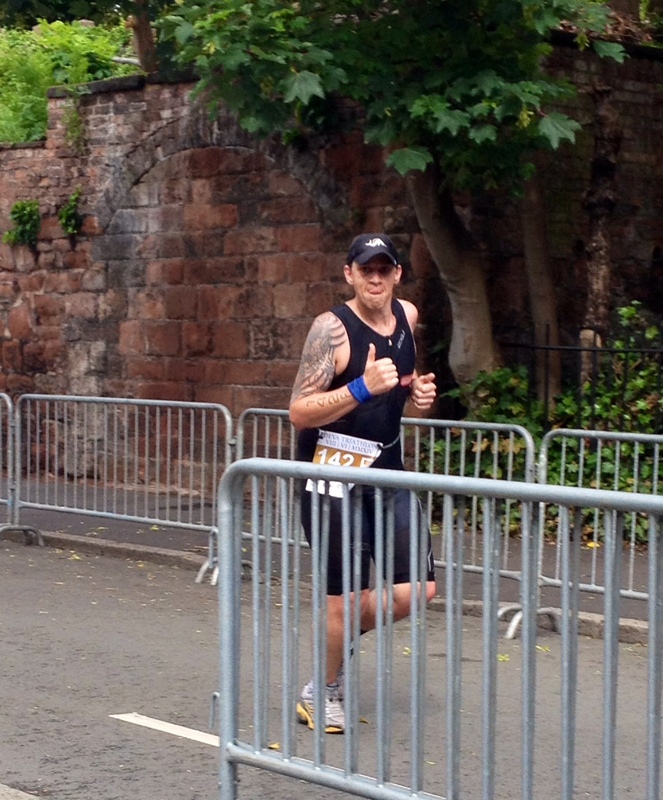 I came away, tired physically but emotionally recharged for the Cholmondeley castle half ironman in a couple of weeks. 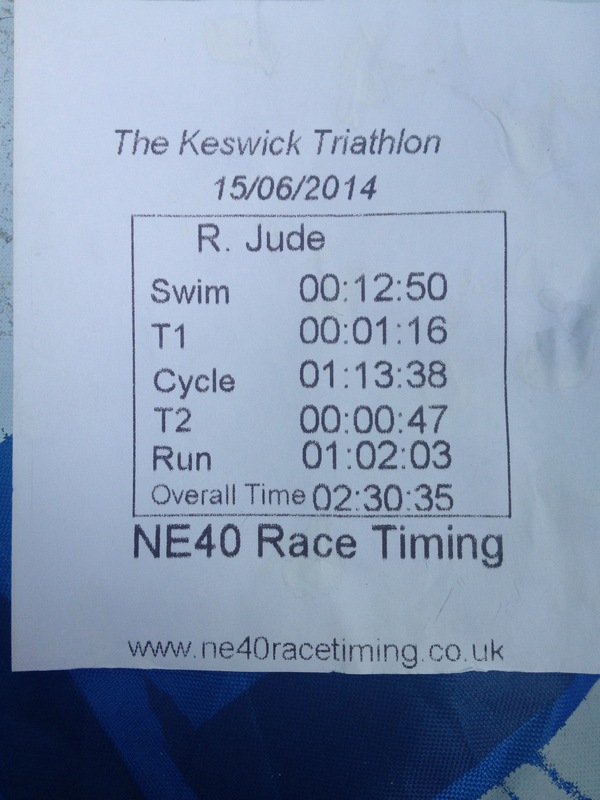 The Keswick event was brilliantly organised and supported and I would recommend it to anyone looking for a triathlon alittle out of the ordinary, even though you don’t get a medal for your efforts. Another early Sunday forcing down porridge. Another morning of being sat in a lyrca tri suit smelling of deep heat. 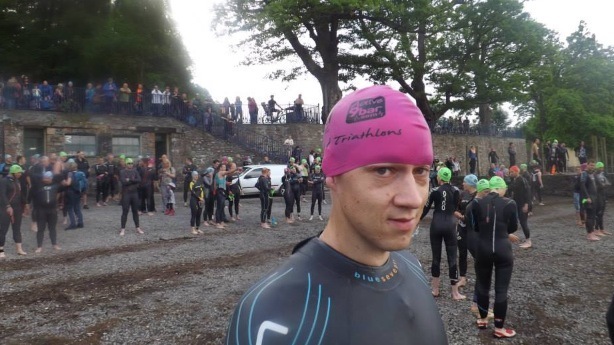 Last week outlaw this week Chester Olympic – same nerves, same worries over the same calf, same plan – swim as hard as I can, ride as hard as I can and then grin and bear the pain on the run. The week in-between the two events I felt pretty good, Monday was a complete rest day as I tend to do after events, I had a 2 mile run on the Tuesday followed by 1500m of OW in the clearest lake ever (especially compared to HPP) Wednesday’s weather was shocking so I switched the planned rest day around and did 32 miles on my bike on the Thursday night, including my first puncture of the yr, early Friday I found my running legs and did 8 miles and everything felt good – apart from the calf which was a niggle. On Saturday I was planning on marshalling at a local event, but with the calf pain noticeable whilst standing and the fact that it was horrendous rain, I didn’t go in the end and spent the day eating bagels and generally being a lazy sod. So up early for the race on Sunday, travelling by myself with the hope / vague plan of sue and zoe joining me to watch the run leg. 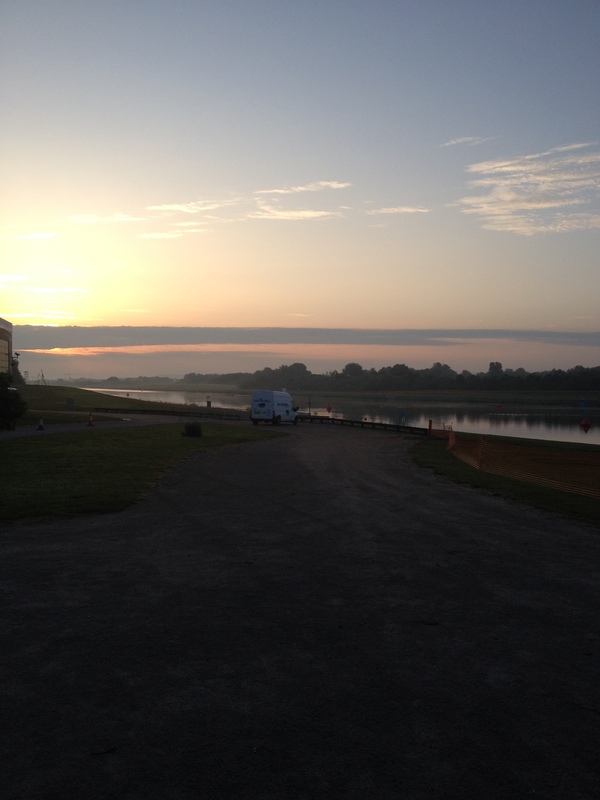 As ever when I am on my own I like to get to events really early to get through registration, visit a port a loo, set up transition, visit a port a loo and generally relax once all that faff is out of the way, then go to a port a loo, then find the swim start. It was whilst bumbling around transition, pretending to know what I was doing that I bumped into the wonderful people of 9bar – who were supporting the event and handing out the goodies pre and post-race. It was good to put some friendly faces to some names and properly meet some of the people who send me training goodies in the post. Lovely to see the enthusiasm for the products they make and great to spread the love around so many fellow competitors. I was in the second wave of the day, so got to see the start of wave 1 and before long we had the briefing and got told to jump in and swim to the start. The river was surprisingly clean considering the recent heavy rain and the current was noticeable, but not as bad as I was expecting – although when you stopped swimming you soon ended up 10ft back downstream. I managed to find a bit of free space and attempt to swim close into the bank to lessen the effects of the pull – the hooter went off and that free space disappeared as everyone had the same idea – cue a proper smack to the face, not sure if it was a hand or a foot, all I know was that it bloody hurt! It was an upstream start before a turn and the last 500m with the current. As it was a qualifier for the worlds I was expecting to get dropped by everyone right from the get go and my wave pretty quickly split into two groups – with the fish boys disappearing into the distance. I plodded on and got into a reasonable rhythm quiet quickly but seemed to take ages to reach the turnaround point and I had the usual doubts about being last out of the water from my wave. I passed a few from the previous wave and was happy to see the get out point and to find no cramp in legs when I started the run up the hill and steps to T1. 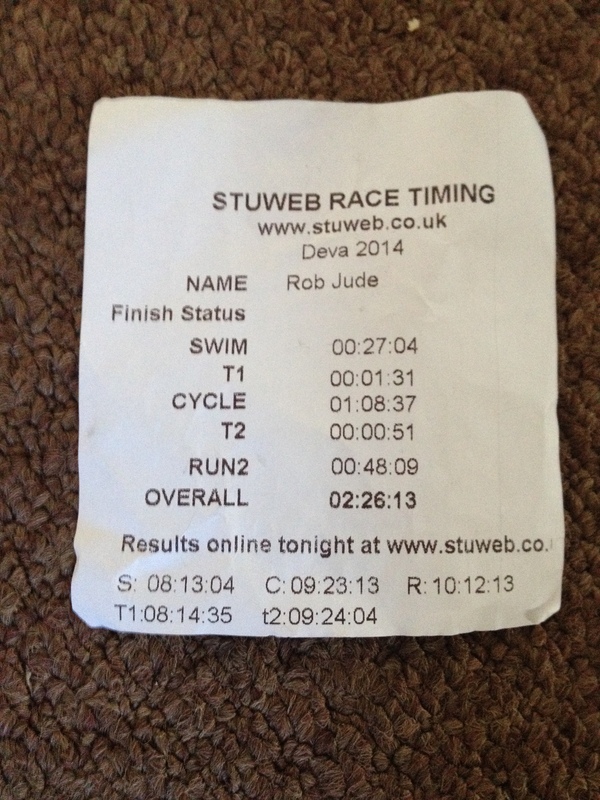 Swim time 27:04 including the run to T1 and extremely happy to see a fair few bikes left around the racking of my wave. Into T1 and found the fact that I had cut a section of my wetsuit off both legs after last weeks first swim in it, and adding to the fact I had decided not to go with calf guards (to see if it helped the issue) and had lubed up my ankles the wetsuit came off in double quick time and I was in and out next to know time. Much better than previous issues I have had – also no cramp taking the suit off this time. 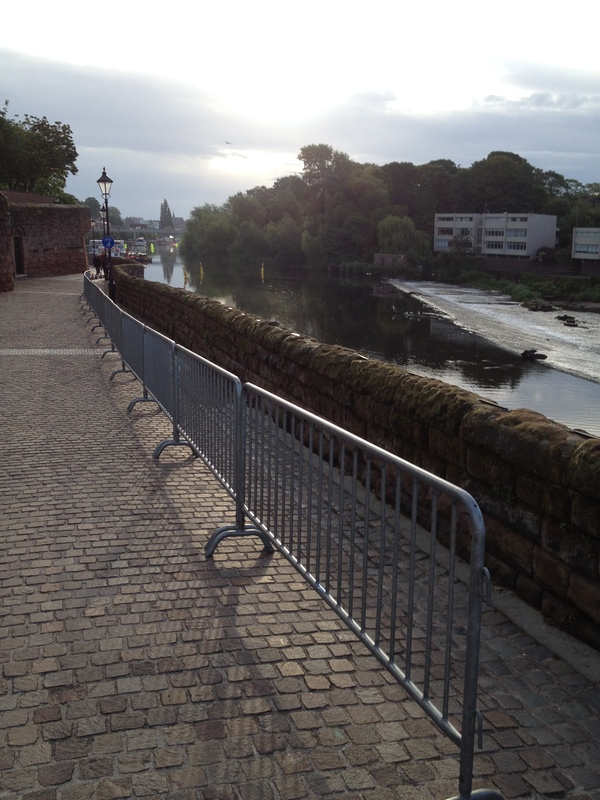 It took a while to get my left foot into the shoe when I was going, but I was still passing people on the first rise out of Chester and it felt good to settle into the route. It was one large looped course with no real hills to speak of but a few rollers along the way, I made steady progress, keeping my HR where I wanted it in order to attempt to have some energy left for the run and not have to crawl around the 10k in an hr. or so. Only one person passed me – a Torq team member going like a rocket and I lost count of the number I managed to pass, had a nice game of cat and mouse with one bloke before he almost decked it on a corner towards the end, scaring a marshall on the way. Back into T2 and out quick enough although struggled to find the exit until I saw sense and looked for a sign, maybe I should look for the signs when I bumble around before the start. Legs felt ok to begin with as I trotted through the first section, up and over the small bridge which bounced around due to everyone’s collective weight. Then down back towards the river and the turnaround point before heading along it under the same bridge and out to handbridge, across that and then back down towards the finish. Got a shout out from the PA, got an even bigger shout out from sue and zoe (who was wonderfully sitting on a bin in her bright orange outlaw top from last week, then a big shout out by the 9bar crew. Only issue was I had another 2 laps to do and I could feel the calves tighten as I went. The weather wasn’t boiling hot but I took the chance to have some water and poor some down my back – the rest of the run was uneventful, just got progressively slower as I went along with the calves getting progressively more painful. I didn’t bother checking my time on my watch and left it on the HR setting and new I was pretty much doing all I could at that point as it ticked along at 175. So I didn’t check my time at any point as didn’t want to be disappointed if I was behind the plan massively. I have only done 2 Olympic distances before – one in the lakes which was hilly as hell and one at Hyde park when I was at my fittest and lightest last August. The plan was to be closer to the Hyde park time compared to the lakes time. 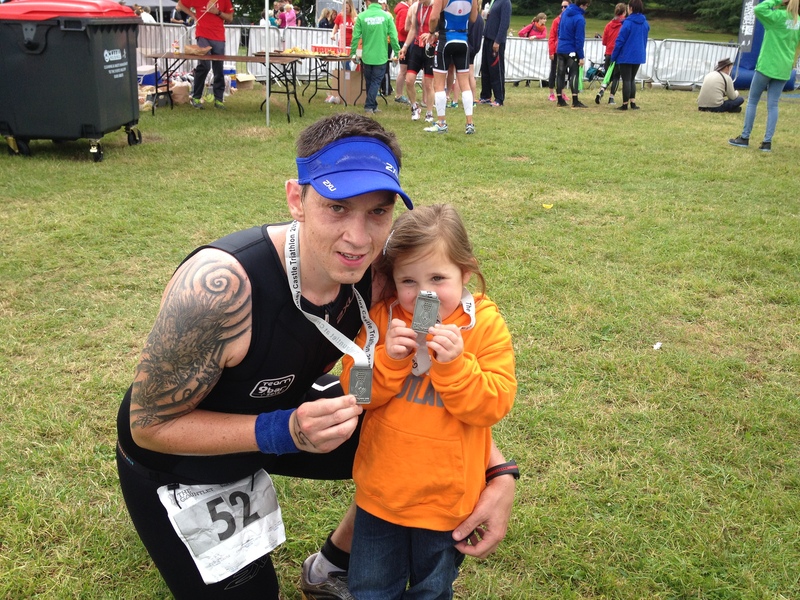 I was delighted to come home in 2:26 for a new PB. And still feeling good – not completely spent. At the end I had a brief sit down and then had a free massage in an attempt to ease my calves off – did my best not to cry throughout it. I don’t like doing the same events twice, due to being able to measure progress or lack of from previous years, but apart from the lack of a medal I would definitely do Chester again – it was really well organised, with good marshalling and it was one of those events where it seemed like a party atmosphere and helped you along the route and nothing seem too much trouble. Once again many thanks to 9bar for the entry and pre and post fuel and to udderly smooth for the support, I am beginning to feel really comfortable on the bike this year and the times are tumbling as a result and without both of them helping doubtless I would be struggling more than I am. I just hope my calves improve and sort themselves out sooner rather than later. One suggestion is salt tablets to help the cramps from occurring and this is in the plan today to review and acquire. I have alot to look forward to for the reminder of June – next weekend in the lakes for the Keswick Tri (which I have just found out has a crazy tough run route in it) and a long weekend family holiday, then a free weekend at home (with some big miles planned) before the 70.3 at Cholmondeley Castle, part of the castle series, which I have heard loads of good things about. So Saturday came and I was stood in a hotel bar meeting people from the internet for the first time. People from all over the country and who only know me by the name budgie and my tendency to injure myself. After the introductions it was like we had known each other for a lot longer than 5 minutes and after a nice meal and some gentle mickey taking and tickling the nerves ahead of the race tomorrow and we dispersed our separate ways ahead of the 4am alarm call. 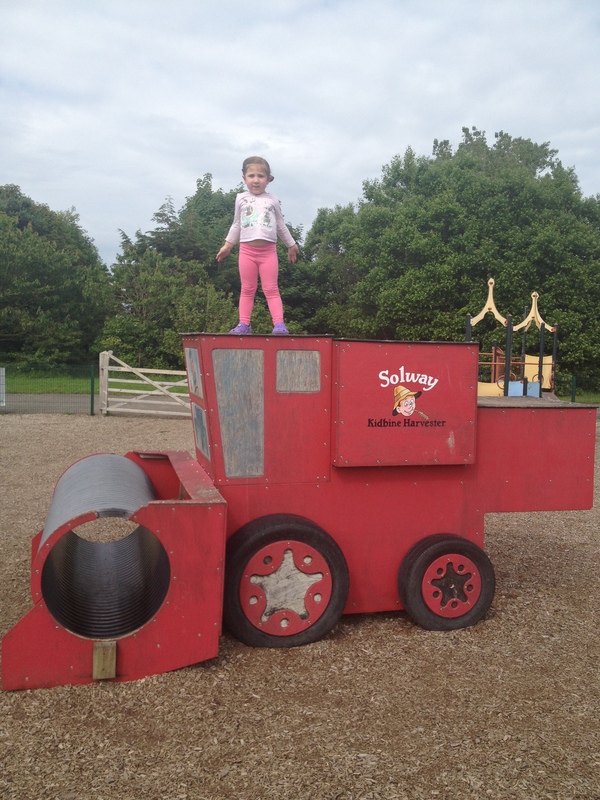 The sleep was shocking, mainly due to the noise in the hotel and a screaming child but apportion was bound to be down to nerves – so much so that I was wide awake by 3:45 and worrying about if I had packed all the right things in all the right places. I was most nervous about the new wetsuit which I acquired on the Saturday and which I would only get to use for the first time come the race. We packed up and headed down to the breakfast and helped ourselves to as much as I could stomach – piece of toast and then followed a stream of traffic to the event. Funny driving through Nottingham city centre at 5.30 on a Sunday to watch the hordes of walk of shamers going home beer stained and swaying in the streets. Those were the days. All racked up and ready for the off I calmed down a bit once I had my wetsuit on and it felt perfect – as soon as I could get into the water I did. I needed to test the suit before the off and managed to do about 5 minutes gentle swimming to ensure that it was ok, looking back not entirely sure what I would have done if it wasn’t! The lake although pretty from afar wasn’t quite as pretty up close. In fact it stank and was generally grubby and full of weeds. Akin to the worst bit of open water I have swam in I think – thankfully it turned out to only be the end which was like that. When we got going after the initial battering, where I caught a cracking blow to my forehead I managed to find a little space and swam ok – although I somehow managed to swim into a few of the rowing buoys that were out – I assume this means I wasn’t entirely swimming straight – no real change there then. After the turn around point I relaxed into it and started thinking about what was to come for the rest of the day. This daydreaming was cruelly shattered by cramp in both my calves about 200 metres from the end of the swim, I found myself screaming in frustration under the water and gritted my teeth, slowed down and kept going hoping it would pass. I used to get cramp quite a lot whilst swimming but since using calf guards I haven’t ever had it – I thought the recent curse was back, but it eased a little and I stopped using my legs for a while. Maybe it was a reaction to my dodgy hamstring or the fact that it was taped up but I was pleading for it to be ok when I got out of the water. Thankfully it was, I could feel them still being tight on the amble to my bike but not as bad as I had feared. The wetsuit came off pretty well, although again I got cramp in my left leg and sort of hopped around like I had been shot in the calf. When I finally finished prancing around I managed to put my helmet on back to front and almost forgot my number belt. I’m such a pro. Out on the bike ok, managing to see the supporters and again a massive lift and was good to pass a few straight away on the bike – saw one guy deck it by the lake on a very expensive looking bike, then we were out into the countryside. I seemed to settle into a good rhythm and speed – well within my HR zones and what I have trained with so I knew I told sustain that pace if my body and bike held out. I managed to catch Gareth on the bike after about 10 miles and he was smiling from ear to ear – probably the cup of tea in T1 was doing him the world of good. I loved the bike route and it was nice to not get overtaken to often apart from the speed freaks who flew past me like I was stood still. Managed to play cat and mouse with a few folks for most of it, up the ‘hill’ gears wouldn’t shift and I thought my technical curse would continue but just kept going – standing up and didn’t lose too much time. Didn’t stop at first feed station as per my plan and the gels in a bottle worked well – a lot better than having to mess around opening the gels, something I will def do at the full. I also had 2 pumpkin 9 bars right on cue on the bike leg and never felt the power drain from my legs. I kept waiting for Andy on his Italian stallion to come flying past me and assumed that he must have at some point but I missed him. 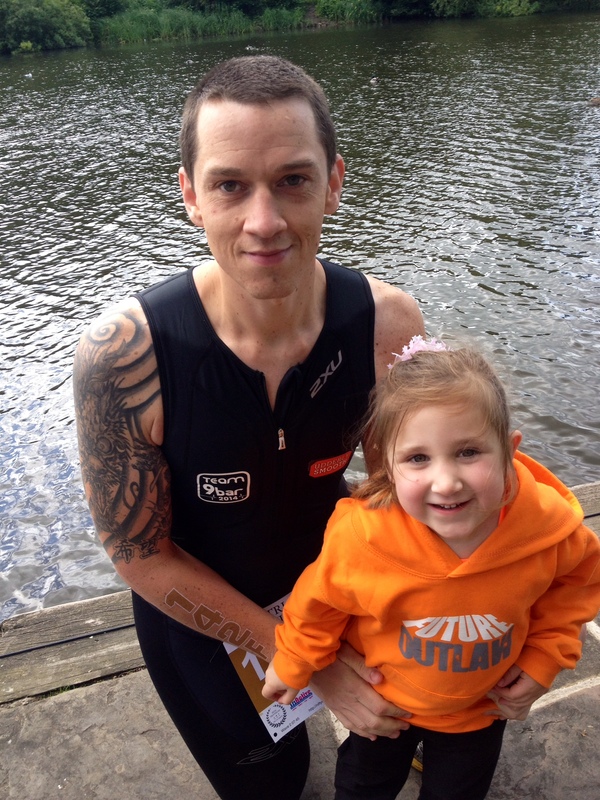 Turns out swallowing half a lake filled with swan poo is detrimental to biking performance. Rest of the course had a few rollers in it, but it was really enjoyable, especially the crossover bit where you saw others heading out onto the first lap. Noticed towards the end of the bike a sort of bumping – like something was up with the back wheel but thought it might be just because I had done the off-road bit with pot holes and ramps everywhere, I was worried I had a slow puncture and was crossing my fingers that it held out until I got back to T2 – turns out my rear wheel looked like this at the end. Looks like I tested the limits again on mechanic performance. I definitely wasn’t smiling about 2 miles later when the reality of the run set in. I enjoyed the course due to the flatness but found the first out and back section a bit tight and constant stream of people meant you felt quite boxed in, although I guess if I was going quicker I would have found some space. I stopped for my first ever pee stop in a race so maybe I over drank on the bike and probably lost a minute or two struggling with the loo / trisuit situation. But felt a lot better and certainly lighter afterwards. Not long afterwards I saw Andy – he looked good although very hot and I was worried he was going to catch me as he seemed to be moving a lot faster than I was. But to be honest by that point I didn’t have a lot left in me and was struggling to run between the feed stations – and there were a lot of feed stations. Quick word to the marshals and volunteers around the course – especially the kids handing out coke, high 5, water and gels on the run – always smiling and happy and with a word of encouragement – I like to make a point of saying thank you to everyone as after all without them a tough day out would have been even tougher. I would encourage you to say thanks folks to them at every race you do – I didn’t hear to many doing so on Sunday and it annoyed me a little bit to be honest. My tactic of sipping coke at every station and then covering myself in water seemed to work and sipping on a gel between get me going and although I never felt completely knackered, I could feel the cramp in my calves every step and was glad to get the first wrist band. I plodded on to the end of the first lap and thought I was on course for sub 5:30 which was the target time and by that point it really was a plod – managed to miss the supporters on the lap but the pirates and a few random (very confusing shouts) of budgie saw me through back to the lake and just kept going at my steady, slow pace till I got to the last feed station. Knowing it was ‘just’ back down the lake to finish was brilliant although it looks like forever when stood there and then from out of the blue I heard a friendly, south African accent asking me to hold his hand down the finishing cute. Gareth had caught me up and we managed to run the last bit together, in all fairness I had no turn of pace and he fell in line with my shuffle rather than power off – sign of a true gent. By the time we got to the start of the red finishing chute the atmosphere was lovely with noise and music and it makes you feel like a million dollars, all the aches and pains fade for those 30 seconds and you really do feel like a winner, even if you finish an hour + behind the actual winner. Gareth acquired his son and I hung back to let them cross the line together – I just hope I didn’t photo bomb the finishing shot for them. After resting under a tree, drinking 1 litre of coke and two ice creams I felt ok and we posed for a nice group shot at the end. We attempted to spot other folks finishing but didn’t see that many we knew, but it’s an incredibly emotional thing watching some finish – even if you don’t know them it’s hard not to be proud and close to tears as you hurl support at them in the final yards down the chute. God knows what I would be like if sue ever did one – I was emotional enough when she finished her 10k! 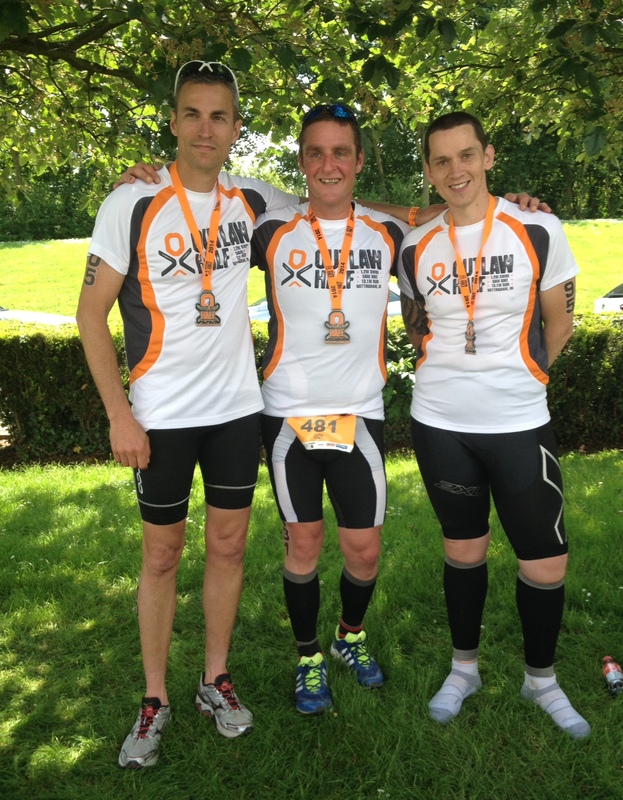 All in all – a brilliant weekend of emotions and I really well organised event. See you in 8 weeks for the full!